Scuppernog scuppernog SCUPPERNOG! It’s kind of a hilarious word, right? A couple weeks back my husband and I went to visit his family in the South. While visiting my fabulous sister-in-law’s family in Raleigh NC, we wandered at length along the bike/run/walk path near her home, which was heavily overhung with greenery. A generous helping of the plants along the way were total unknowns to me, including the scuppernog, a close cousin to our usual grapes, and variant of muscadines (Vitis rotundifolia), which are native to the American southeast. Small clusters of unripe scuppernogs, Vitis rotundifolia. The scuppernogs were under-ripe (when they’re ripe they’re larger and bronze-colored), but we found clusters of them growing on vines that were a dead ringer for normal grape vines here and there. 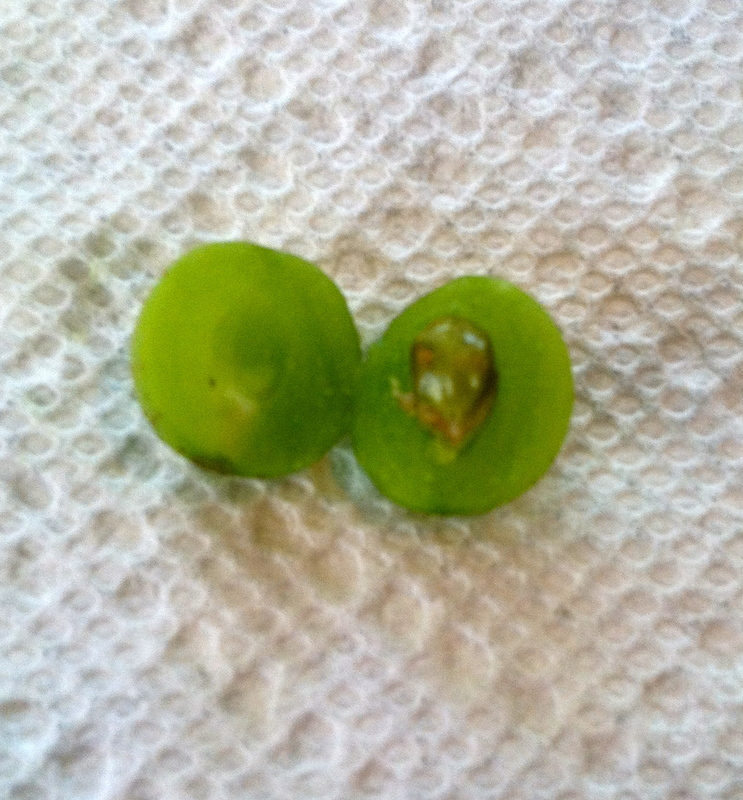 My husband and sister-in-law recognized them right away, and their identity was further confirmed by the large single seeds we found inside. 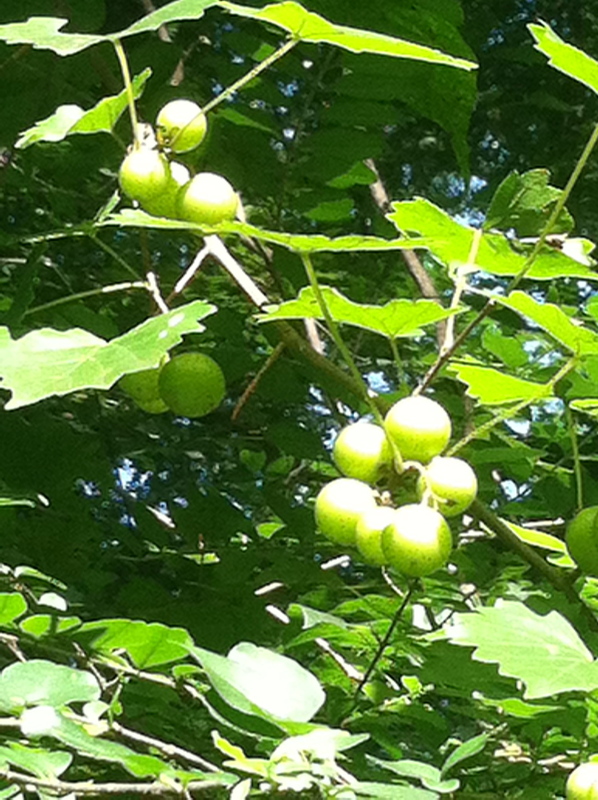 Scuppernogs are, I gather, favored for their jelly, rather than as a raw snack, and muscadine wine is a local treat. This entry was posted in Do eat that!, edible plants and tagged Plants from the South, scuppernog, wild by aewills. Bookmark the permalink. Ahhh…I love that book. Such a classic. I will say that it was somewhat overwhelmingly hot and sweaty in Raleigh–my planned 2-lap jog of the 5k bike path VERY quickly became one lap (can’t…escape…hot wet air…feel like I’m running INSIDE a lung…). But the BBQ more than made up for it :). We brought back some sauce to enjoy the flavor of the South in the cool of the West! Oh Hey! I also love the new blog! Welcome to the ex-Harland runner blog collective. Southern grandmas make great scuppernong jelly.